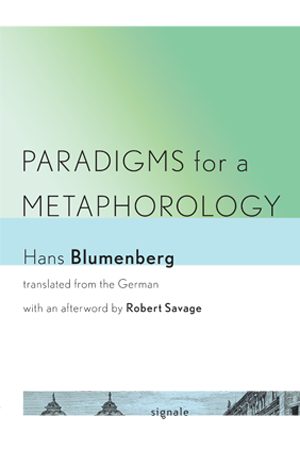 In Paradigms for a Metaphorology, originally published in 1960 and here made available for the first time in English translation, Hans Blumenberg (1920-1996) approaches these questions by examining the relationship between metaphors and concepts. Blumenberg argues for the existence of "absolute metaphors" that cannot be translated back into conceptual language. Absolute metaphors "answer" the supposedly naïve, theoretically unanswerable questions whose relevance lies quite simply in the fact that they cannot be brushed aside, since we do not pose them ourselves but find them already posed in the ground of our existence. They leap into a void that concepts are unable to fill. The late Hans Blumenberg was Professor of Philosophy, Emeritus, at the University of Münster and the author of books including The Legitimacy of the Modern Age, The Genesis of the Copernican World, and Work on Myth. Robert Savage is Australian Research Council (ARC) Postdoctoral Fellow, Centre for Comparative Literature and Cultural Studies, Monash University. He is the author of Hölderlin after the Catastrophe.